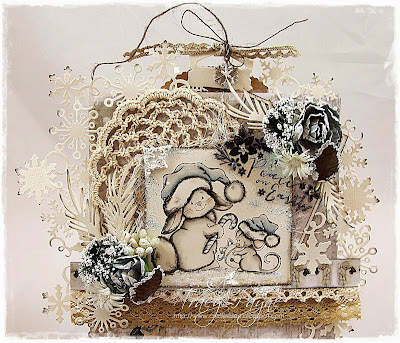 Hi everyone, hope you all have a great weekend planned, Becky here with you today with a card made with Christmas Snuggles from Makey Bakey Mice. Isn't he just the sweetest? I have used distress markers to colour him in. The papers are from Authentique Paper Pad and I have used an On The Edge Brackets die to cut the shape of the card and then distressed the edges with Walnut Stain. 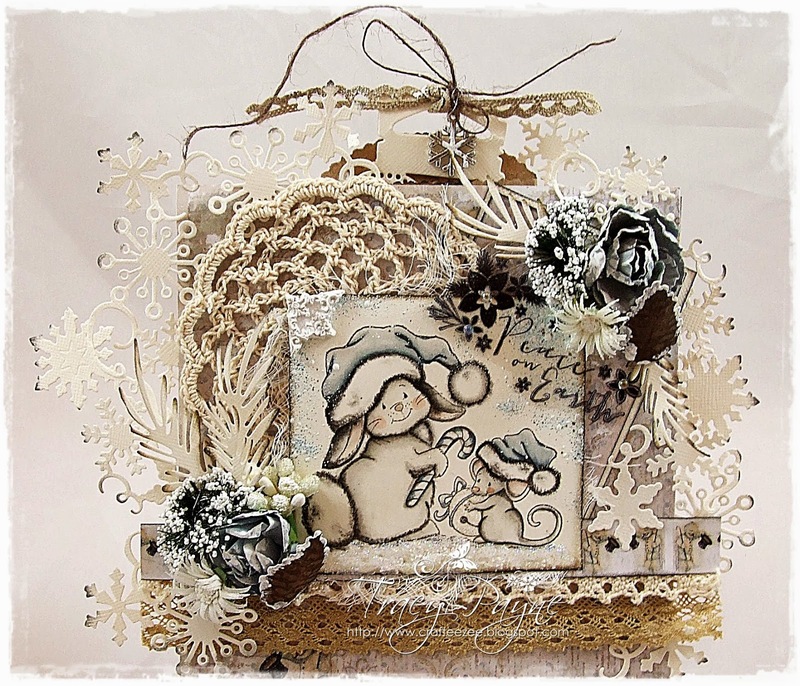 There is a cream crochet doily behind the image with a snowflake charm. There are a couple of the new diamond heart pins in with the flowers, and a cream lily rose and a few cream mini open roses. Silvie here today with a new card to share. 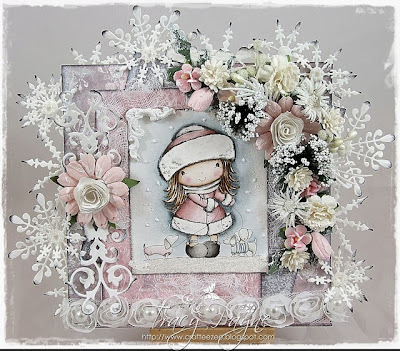 The image on my card is Magnolia - North Pole Tilda from Winter Wonderland collection. Magnolia - Notrth Pole Tilda. 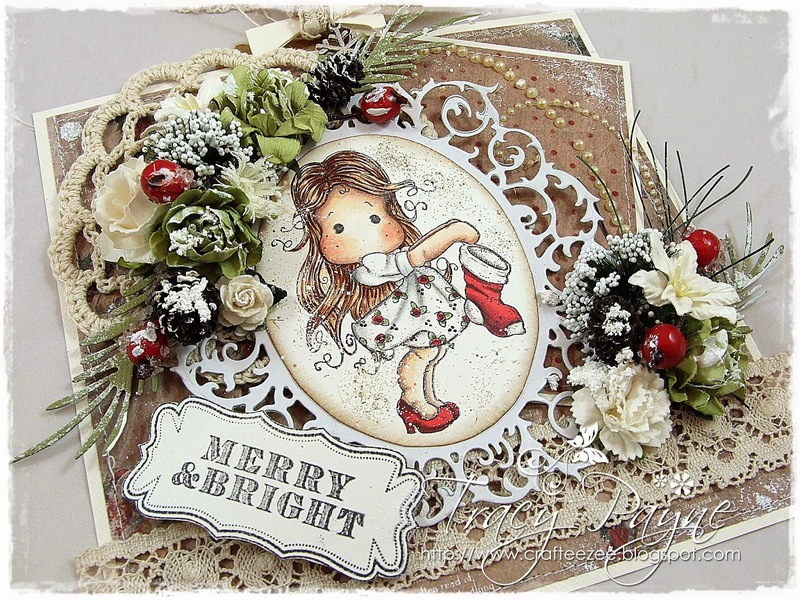 Tracy here and I have another christmas card for you today and the image is called Christmas Tales by Whimsy Stamps and I have to say, aren't they cute! 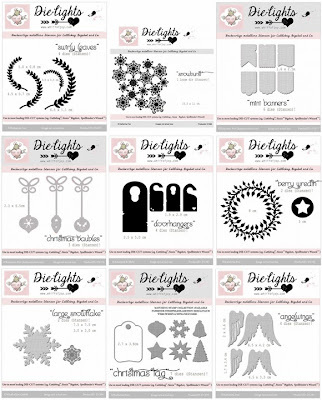 I have used the whimsy snowflake border die all around the edge. The gorgeous crotcheted doilie is just fabulous, love them. I stamped the Kaisercraft text out onto accetate and then added little irridescent flat bead angel white centres. More pictures can be found on my blog HERE. Don't you love that sweet image as much as I do? 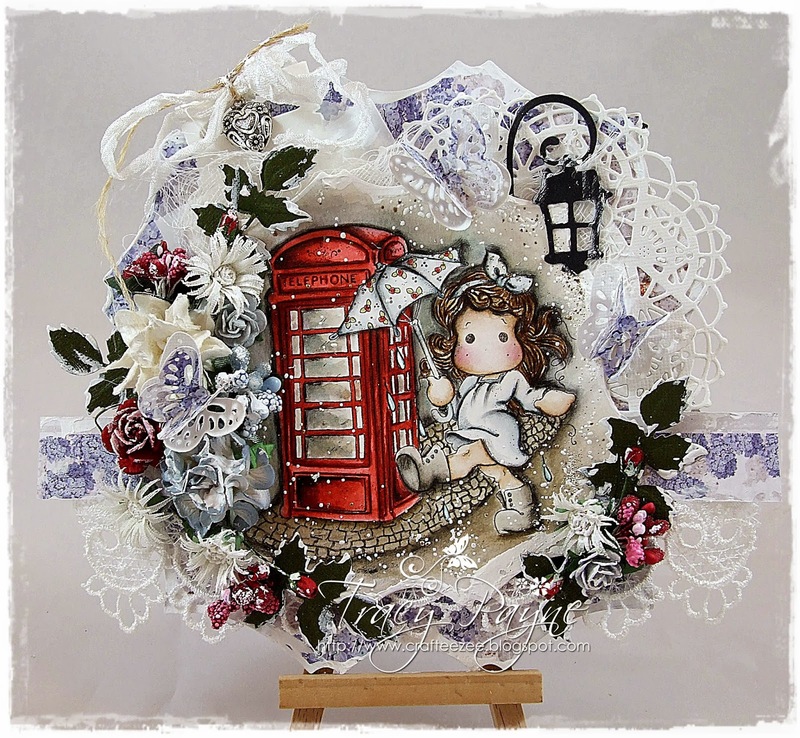 It is from Whimsy and is called 'Christmas Turtle and Dove'. 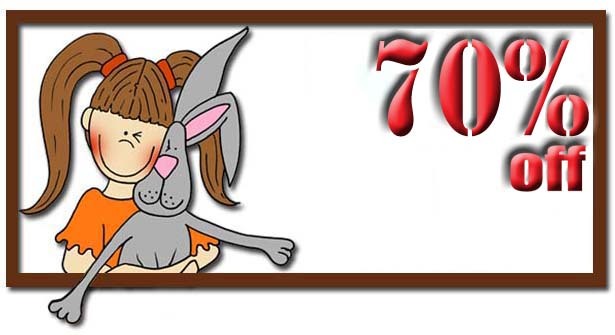 The coloring is made with Distress Inks. The papers I used are from Teresa Collins 'Santa's List'. 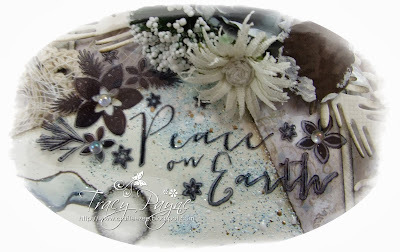 I used the Whimsy die 'Snowflake Mini Letter Seal' and one of the matching 'Snowflake Mini Letter Seal' Sentiment. I embellished my card with few paper flowers and a Christmas Tree charm. Hey... I didn't drink any vine before I took this photo above... somehow I didn't manage to get it straight... Anyhow, below you can see a close up of the image... I surrounded it with some Frantage. Wish you a wonderful day now. 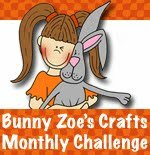 Silvie here with a new make to share. The image on my card is Bildmalarna - Mimosa Ear Muffs. She's colored with Copics. 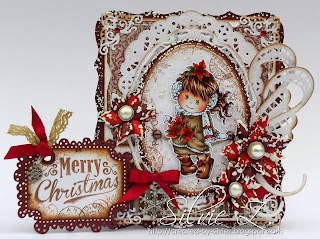 The paper is by Kaisercraft - St Nicholas paper pad. Hello and good morning everyone. 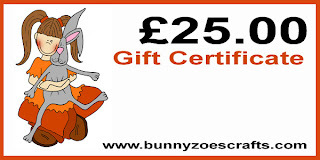 Today I have a new card to show you. Not a Christmas card for once :-). For my project I used not only one of my fave color combo, but also one of my fave images by Bildmalarna 'Mushroom Hug'. 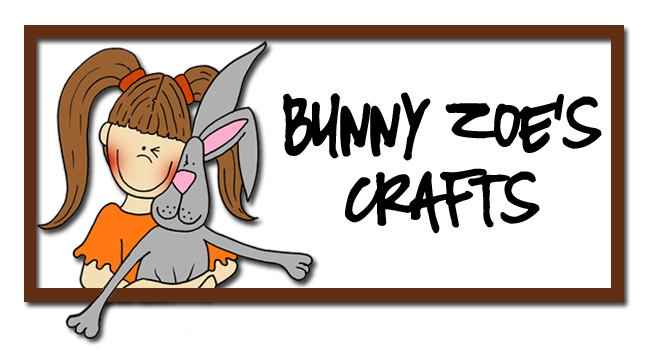 The 'Have a wonderful Day banner' is from Bildmalarna too. 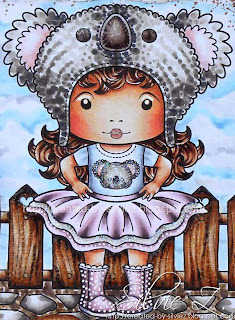 The papers I used for my card is from Kaisercraft '75 Cents', one of my fave. 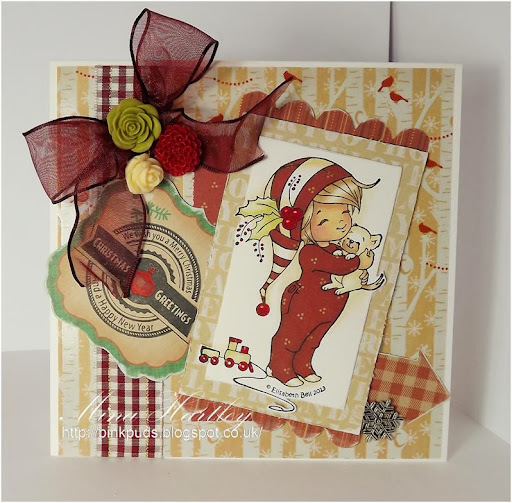 In the corners I used the gorgeous Marianne D Anja's Vintage Corners. The colouring is made with Distress Inks. And I added some Stickles onto her wings and also few other parts. Below you can see a close up of the colored image. 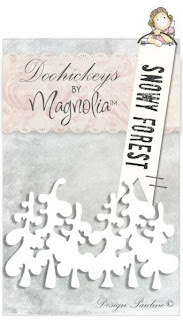 The little tag is made with the Magnolia DooHickey So Wrapped Lovely. And I added a sweet Mushroom Charm onto it. It is currently out of stock, but am sure Nikki will have it available soon again. Thank you so much for looking. Wish you a wonderful day now! 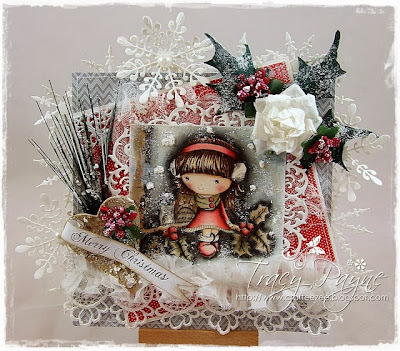 Tracy here with a Magnolia Christmas card. The image is called "The Day Before Christmas Stocking Tilda" and coincidentally I have used the Magnolia paper also called "The Day Before Xmas 12x12". 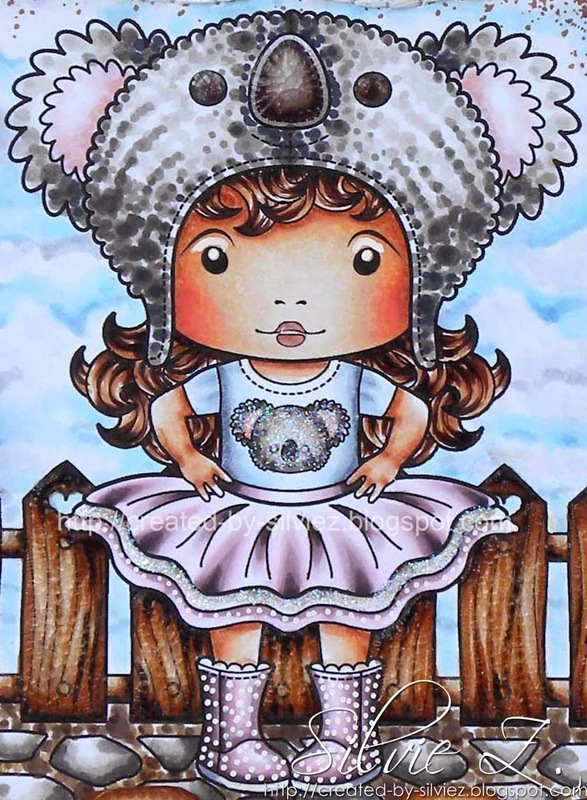 Tilda has been coloured with Copic markers. I have used the fabulous crotcheted doily in cream, don't know how I couldn't have noticed these before in the store. 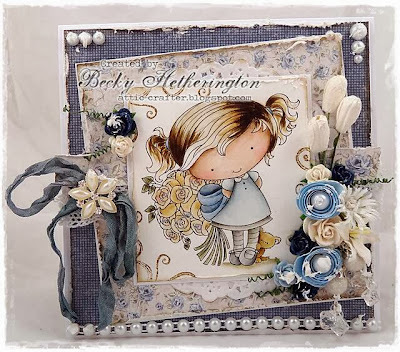 I have used the Kaisercraft pearl flourishes cascading up from the bottom right flower arrangement. 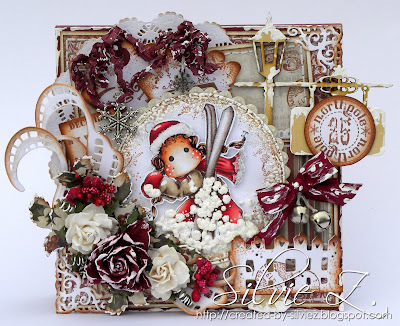 The flower display on the top right consists of Kaisercraft paper blooms in olive, works fabulously with the red. I have also used the magnolia doohickey sprawling ferns die for the foilage. The tag at the top has been cut from another magnolia doohickey, definitely a favourite of mine, so wrapped lovely and a snowflake charm attached. Lastly I have finished off with the text MERRY & BRIGHT by Kaisercraft called Holly Bright Peace. As always lots more pictures on my blog. 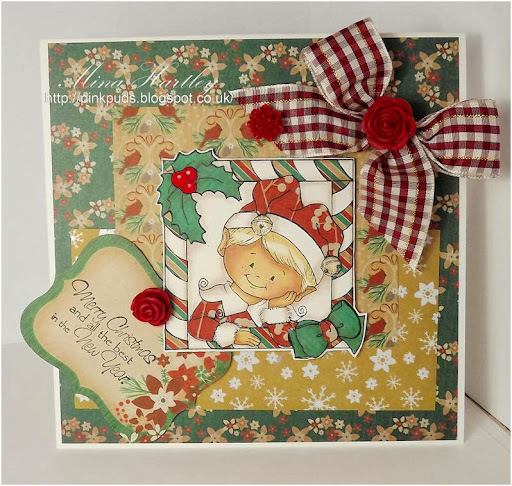 Hi, Kathy here with a card I made using a gorgeous stamp from Wild Rose Studio called Bluebell with Poinsettias. Ism't it so sweet! 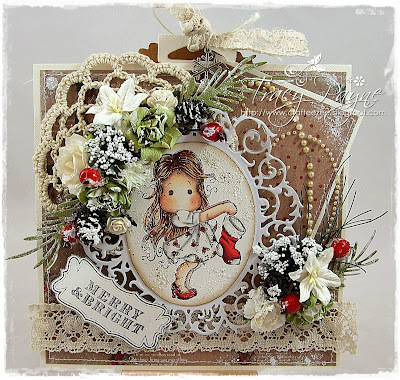 I also used Season's Greetings Notables 7 and the Double Scallop Doily die from Whimsy Stamps. 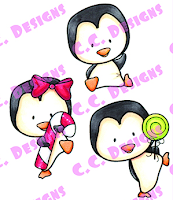 I used copics to colour and added a little rock candy stickles to the ground. The paper is from the MME Mistletoe Magic pad and I used a piece of light pink raffia lace behind the doily. 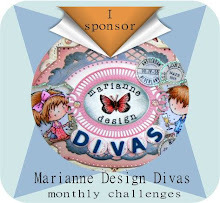 Marianne D Collectables - Corner and Winter Sent.